Sadly, there are many cowboy traders out there and rogue tradesmen who are only out to make a quick buck and leave customers with an unsatisfactory job. For many people, dealing with a tradesman of this description can lead to a general fear that all workmen are similar and for the odd few, negative experiences of tradesmen goes one step further towards intimidation and harassment. As a consumer, you should do all you can to protect yourself from such situations by only hiring reputable tradesmen who are part of a trade association and only dealing with them if they meet your high criteria of standards. Always get an office contact number and address, ask for references and never pay up front. Still, for the odd few who have done this and still find themselves in a poor situation with a tradesman, it's important to know what to do if you feel intimidated or harassed. When you employ a tradesman, you are paying their wages for work carried out - essentially this means you're their boss for that period of time and therefore you should never let them push you around. 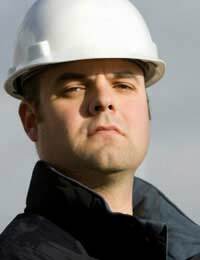 Many tradesmen are used to dealing with subordinates and newcomers and they develop a fairly aggressive stance on dealing with questions to their authority. You have to find a middle ground and be prepared to stand strong against any tradesman who may be trying to push you around. If a tradesman sees from the offset that you're a 'pushover', they will most likely push your work to the backburner and take their own time in dealing with the task at hand. You have to maintain regular contact with your tradesman and outline exactly how often you want to be updated with progress. A tradesman who realises that he or she has to report back to the paying customer on a regular basis is less likely to start cutting corners which eventually can lead to intimidation. Normally when a tradesman resorts to using intimidation, they're trying to assert their authority and this comes from fear generally. It may be that they're falling behind on the work schedule, that the work isn't up to scratch, or that they simply aren't qualified to carry it out in the first place. If you feel that you're being intimidated in this way, or being 'put off' by the tradesman, don't back down. If it starts to feel that it's becoming threatening, immediately ask the tradesman to leave and call the police. If this doesn't work and you are starting to feel that the tradesman is harassing you into paying or signing a contract, call the police. Don't wait for matters to get out of hand - especially if you feel physically threatened. If you're being verbally intimidated or harassed, try ensuring that you have a witness to it so that they can speak up for you should it go to court. If the harassment or intimidation is through letters or emails, keep copies of everything and use these as evidence against the tradesman when needed. There are no excuses for a reputable tradesman dealing with a customer in this way. If you feel intimidating by a visiting tradesman at any point, politely ask him to leave your premises and call the police straight away, providing them with as much information as possible. I hired an electrician to fit some lights. He gave me an estimate and said it could go up or down depending on how long it took. He did the work, invoices me for less than the estimate but two months later raised another invoice as he said he’d forgotten to add in the labour. The invoice he sent originally clearly stated parts and labour. He has been phoning me and emailing me for the last few months even bough I’ve told him I’m not paying. He’s now threatening to call at my property daily until I pay it. Additionally the equipment he installed is faulty and he’s refusing to change it until I pay the other invoice. What can I do? Roofer quoted £350 to fix a leak on an extension roof. When they arrived to do the job, they then said after a closer look they couldn't do that job. Instead I should get a much larger job done costing £2500. After I nearly fainted they said they could do something for £900 but wouldn't recommend it. So I said ok put all that in a new quote and I'll be in touch. However they then demand the original £350!! I was shocked, they even left my roof with a brick missing and wouldn't put it back!! They intimidated me into paying, the boss got extremely upset so I had no choice. They were only there for 1 hour, I was even prepared to pay a nominal free to cover that hour, but no they demand and insisted on payment there and then. I had to transfer it as he watched before he left. What can I do now?? I can live without the £350, but it's the principle and I don't want them doing it to someone else. You could take the matter to the court for the small claims court to decide, if you feel you have been treated unfairly, please see the link here . However, you don't say whether the roofers fixed the leak on the roof. If they did - you would have little recourse to complain. Roofer quoted £350 to fix a leak on an extension roof.When they arrived to do the job, they then said after a closer look they couldn't do that job.Instead I should get a much larger job done costing £2500.After I nearly fainted they said they could do something for £900 but wouldn't recommend it. So I said ok put all that in a new quote and I'll be in touch.However they then demand the original £350! !I was shocked, they even left my roof with a brick missing and wouldn't put it back! !They intimidated me into paying, the boss got extremely upset so I had no choice. They were only there for 1 hour, I was even prepared to pay a nominal free to cover that hour, but no they demand and insisted on payment there and then.I had to transfer it as he watched before he left.What can I do now? ?I can live without the £350, but it's the principle and I don't want them doing it to someone else.